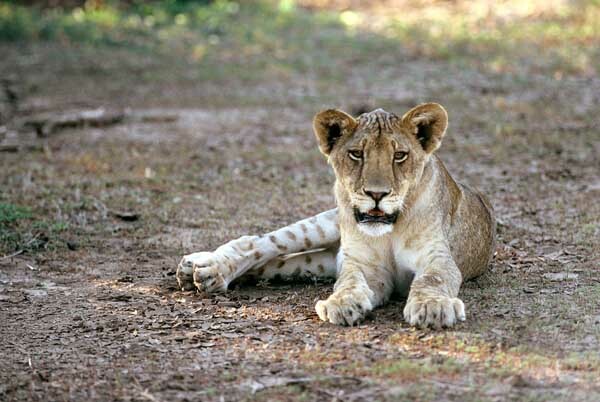 Caption: Lion cub looking directly at the camera while relaxing under a shady tree, Tuli Block, Botswana. Camera Equipment: The photograph was taken with a Canon EOS Elan film camera and Canon EOS 300mm F4 lens, using slide film scanned on a Nikon Coolscan V scanner. Location: The Tuli Block is situated in the remote eastern corner of Botswana, with Zimbabwe to the north and South Africa to the south. Although not as well-known as Botswana's Moremi Game Reserve and Chobe National Park, this remote area hosts a diversity of wildlife, including large herds of elephant for which the area is renowned. Predators such as lion, leopard, cheetah, and hyena are attracted by the antelope that migrate through the area, while for bird-watchers, more than 350 species of birds have been identified. In all, these factors combine to ensure a satisfying safari experience for visitors.